On Friday April 4, explore contemporary art at the New Museum during an evening exclusively for teens! Grab your friends and come for live music, online and IRL art-making, and teen-led gallery conversations. 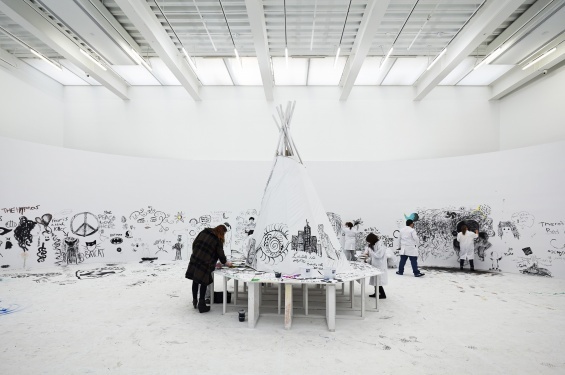 Experience the exhibition “Paweł Althamer: The Neighbors” and participate by drawing and painting on the gallery walls in the interactive installation Draftsmen’s Congress. Artist Paweł Althamer will be present and will offer a special art-making directive for all participants. In the New Museum’s Sky Room, take in the view, “collage the internet” at a digital art-making station by to.be and listen to a live performance by Empress Of, the solo project of twenty-four-year-old Honduran-born songwriter Lorely Rodriguez. Teen Night is free and open to teens aged 14–19 with high school or government ID. No preregistration is required. Attendees can get started on their digital collages now at to.be continue creating during the event, and see the final result projected in the Sky Room. As part of Paweł Althamer’s exhibition “The Neighbors,” Althamer has initiated a coat drive for the Bowery Mission, the Museum’s neighboring organization, which has been serving the homeless and hungry since 1879. For Teen Night, bring a new or gently used men’s coat and have your name entered into a raffle for cool prizes. All coats will be donated to the Bowery Mission. Contact gclass@newmuseum.org or 212.219.1222 ×231 with questions. Teen Night at the New Museum is a G:Class program developed in collaboration with the NYC Museum Teen Summit. G:Class is the New Museum’s interdisciplinary art education program. G:Class empowers youth to think critically about global cultural issues and develop their own cultural perspectives and provides resource for professional educators to carry this forward. For more information visit gclass.org. The NYC Museum Teen Summit is a collective of youth leaders representing different museums in NYC dedicated to improving and promoting the role of youth in museums. For more information visit museumteensummit.org. Generous support for New Museum Teen Programs is provided by the Keith Haring Foundation School, Teen, and Family Programs Fund. Additional support is provided by the Bloomingdale’s Fund of the Macy’s Foundation, Con Edison, the May and Samuel Rudin Family Foundation, and the New York City Department of Cultural Affairs. Endowment support is provided by the Rockefeller Brothers Fund, the Skadden, Arps Education Programs Fund, and the William Randolph Hearst Endowed Fund for Education Programs at the New Museum. Additional endowment support provided by the JPMorgan Chase Professional Development Workshop Program for Teachers. Education and public programs are made possible by a generous grant from Goldman Sachs Gives at the recommendation of David B. Heller & Hermine Riegerl Heller.